The sky is gray and mist shrouds the tree-tops, softening the edge of land and sky. 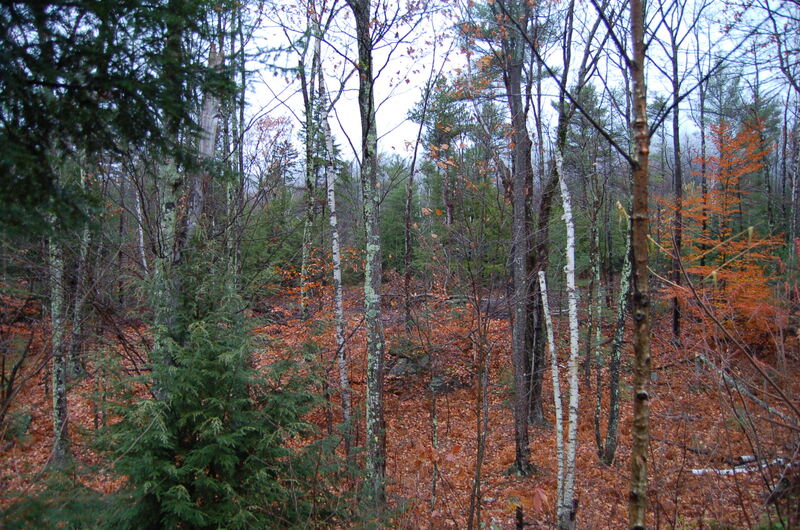 Leaves are a leathery brown, only the conifers bring patches of bright green to the landscape. One hardy petunia is not ready to give in to the chill and damp. This entry was posted in memoir. Tagged blogging, creative writing, Fall, memoir, New Hampshire, November, photo blog, Photography. Your header pix is stunning. I like the big shot, too, but that narrow frame makes the white flower so dramatic. Looks like we’re all bidding the remnants of warm weather goodbye and buttoning up for winter. My favorite time of year in the woods. Thanks for the picture. Ahhhhh. Thanks for popping by, Phil. The dark days of November can be beautiful, before the glorious white days of continuous snow! Each season has its’ own enchantment! 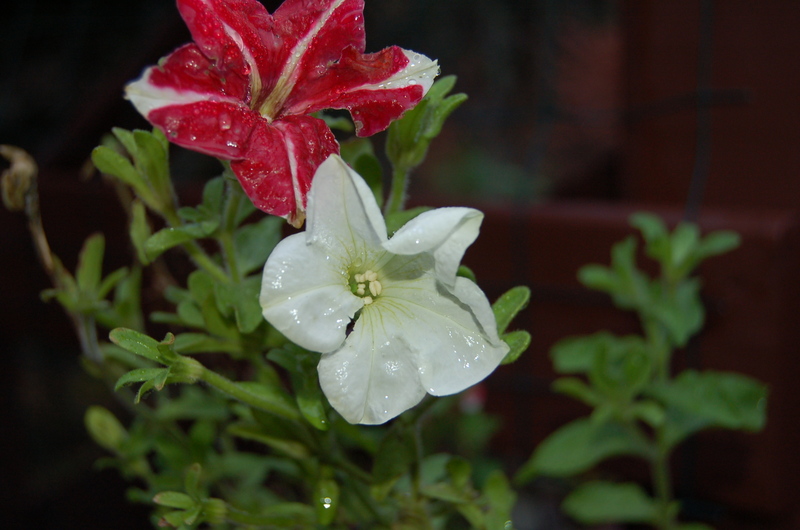 Much like the petunia, I am not ready to give into the chill. I keep hoping for those 60 degree days of Indian Summer. Unfortunately, I think we may have seen the last of those days for a while. Time for “stick season”. Now that my land is more clear, I am loving the “stick season” for the views I never had before. You ARE a petunia, my friend!! We have a few brave souls here in central Iowa yet but they are few and far between and withering fast. Winter approaches. So be it. I welcome the change in season’s but snow and cold I can abide for only so long! Thanks Julie! I had another post ready for this morning but when I walked out on the deck to watch the sun rise, I thought those two little brave souls deserved recognition! You gotta go where the spirit moves you! Amazing how something that appears so fragile can be so strong. Flowers continually surprise me. Wonderful flower photo. There is something about wet flowers that can’t be beaten.